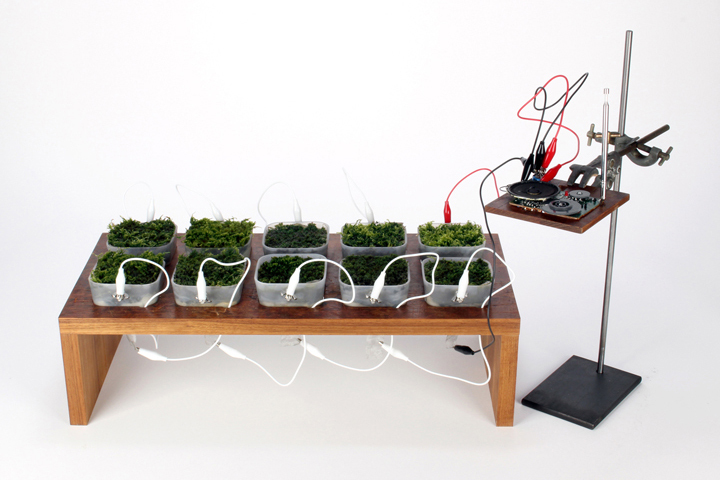 Moss FM is a radio powered by plants. 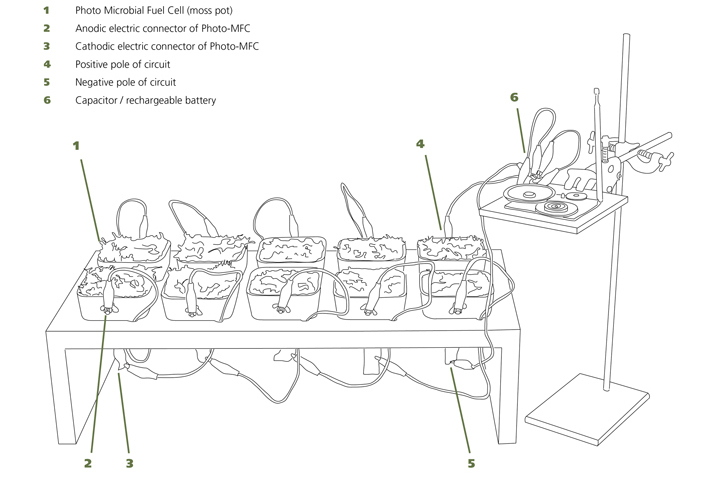 The technology behind it are photo microbial fuel cells, which harness and convert electrons produced by plants during photosynthesis. The moss tufts are essentially used as biological solar panels. Moss FM was designed by Fabienne Felder in collaboration with biochemist Dr. Paolo Bombelli and plant scientist Ross Dennis of the University of Cambridge. Dr. Bombelli has been working on photo microbial fuel cells for years – ever since he was inspired by a single sentence in a biochemistry textbook. 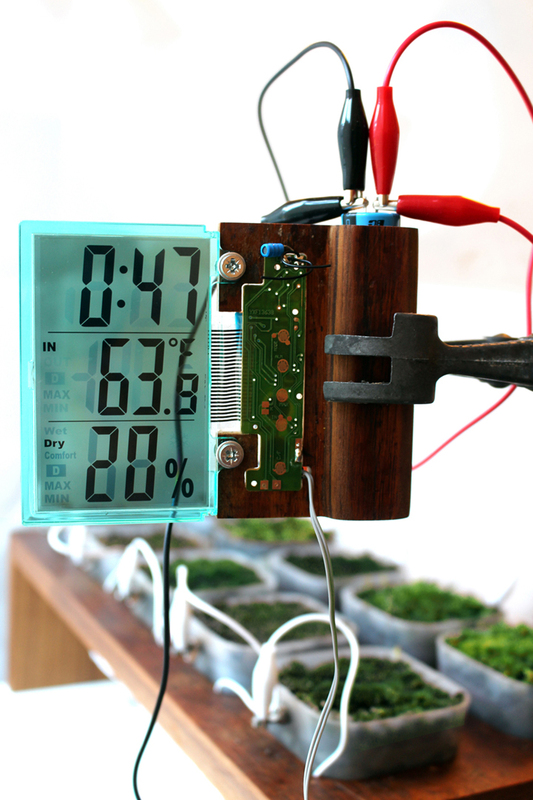 But with Moss FM the technology was for the first time used to power an object requiring substantially more electricity than an LCD, for example. At this point, the radio runs only for a few minutes, with the current stabilised by a rechargeable battery, which is solely charged by the moss cells. However, this seemingly small step is not to be underestimated, as it has – for the very first time – given the scientists an understanding of scalability and real-life application of this technology. As with every emerging technology, many questions are as yet unanswered. We may assume that in five to ten years the technology is applicable in a commercially viable form, mainly in emerging economies. The next step will be to scale up and attempt an architecturally valid project by combining the technology with a vertical garden. Furthermore, a larger scale could also be achieved by transforming rice paddies into electricity generators or with algae farms. Put simply, all we need are photosynthesising plants and enough water. But to give an idea of what kind of contributions this low-carbon technology could make, consider this: If 25% of Londoners (ca. 2.7 million people) charged their mobile phone on average for 2 hours every other day with moss, we would save enough electricity to power a small town: 42.5 million kWh, amounting to a saving of £6.81 Million and 39632 Tons of CO² a year. These are interesting values, given the huge amounts of electricity that are wasted during generation and transmission, for example. And even more interesting, if we consider that at the moment we capture only about 0.1% of the electrons the mosses potentially produce. Is there a wider context? Projects like Moss FM have implications beyond the immediate context of a particular science, in this case biochemistry. Their paddling pool is all of nature, as they stem from a niche movement in design and architecture called biophilic design. This comprises all living systems. In it’s simplest form it might present itself as growing trees into house-like shapes. In an almost mechanical fashion it utilises other animals to build things for us, examples include bees that have made vases and fly larvae that have made jewellery. In it’s most complex form we encounter biophilic design in the world of synthetic biology, where we use micro-organisms to do things for us, such as growing textiles or building materials. Biophilic design is about drawing inspiration from nature, using its processes – but working with nature, rather than trying to dominate it. 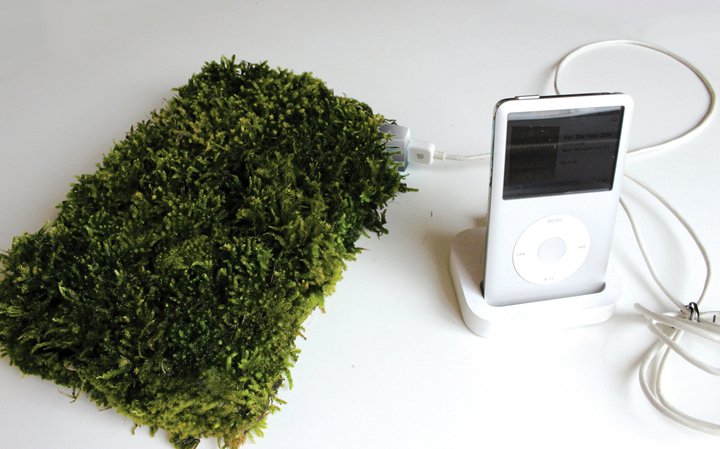 For example: having something like a moss-powered mobile phone charger in the future should sensitise consumers to their electricity consumption and get them to respect their “generator” more, as they have to care for it, make sure it stays happy (much like a house plant) and they suddenly have a physical relationship to – or rather manifestation of – their power consumption. However, all this research and experimentation was not lost when it then came to creating simple individual cells to power a small everyday item. Designer and scientists pushed each other forward – I wanted to respect scientific validity, but I also wanted something that would work in the real world, not just in a lab, which in turn forced the scientists to look at their technology from a new angle. Now designers and inventors alike are beginning to take a new approach on how to work with new technologies and materials. We are undergoing a paradigm shift, where we are engaging in a more collaborative and symbiotic relationship with biology and technology. We will need to incorporate living materials into our urban environment. It is no longer an ‘advanced’ architectural solution to only incorporate mechanical systems to control the climatic environment. As a response to this, we have designed a wearable substratum that houses the Vibrio Fischeri bacteria and re-introduces energy production into the public space. The bacteria is no longer luminescent in the squid but on our skin. Furthermore the light is activated by a person’s movement, thus the human body and the piece itself develop this symbiotic relationship.